Preheat oven to 350° F. Grease and line 13 x 9-inch baking pan with parchment paper, allowing 2 inches overhang. Stir sugar with cinnamon until blended; set aside. Prepare cake mix according to package directions. Fold in 1 cup cereal. Scrape into prepared pan; smooth top. Sprinkle cinnamon sugar evenly over top and swirl into batter. Sprinkle with remaining cereal. Bake for about 30 minutes or until tester inserted into center comes out clean. Let cool for 20 minutes in pan. Using parchment paper as handles, remove cake from pan and place on rack; let cool completely. In microwave-safe bowl, melt chocolate with cream on Medium, stirring every 30 seconds, for 1 or 2 minutes or until chocolate is melted. Drizzle cake with melted chocolate. Cut cake into rectangles, about 3-1/4 x 1-1/2 inches. Serve cake warm with warm chocolate sauce if desired. Churros are a traditional Spanish snack and are made by deep frying dough and rolling it in cinnamon and sugar. 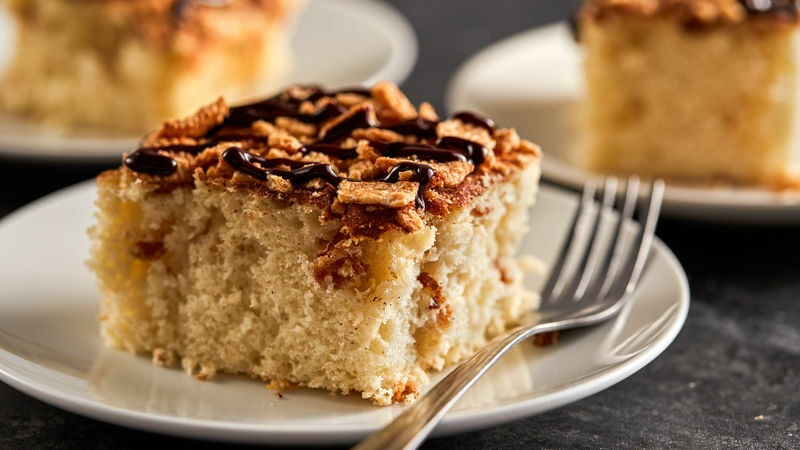 The Cinnamon Toast Crunch cereal topping on this churro cake perfectly replicates the flavors and irresistible crunch of traditional churros. This and other dump cakes make preparing dessert a cinch. Nevertheless, baking a made-from-scratch cake is also surprisingly easy, promise!